NBC’s business reality competition show that has celebrities fighting for the chance to win money for their charities, “The Celebrity Apprentice” is back for it’s fifth season. But, if you are counting the full franchise that includes the original “The Apprentice”, then it’s season 12. Real Estate billionaire boss and executive producer of the show, Donald Trump took time out of his schedule recently to talk to press on a phone conference call. Hear snippets of audio from the phone call in the video player below. Trump stated that having former talk show host, and comedian Arsenio Hall on the show this season was “a great get”, because he stated that Arsenio “became almost reclusive” after his big success with his night time talk show, which Trump also stated that he’d like to talk to Hall about. “People wanted him for different things and he wouldn’t do it. I view this as Arsenio’s coming-out party,” said Trump. Trump also stated, “Wait until you see what happens. He really does a great job. I think that Arsenio will have a very major show after Celebrity Apprentice” in which case Trump joked that he wanted ten percent of. If Trump had to compete himself on “The Celebrity Apprentice” when he was starting-out, he said that he probably wouldn’t do that well. “It’s such a hard job and these people work so hard.” Trump said that he thinks that the celebrities work even harder than the non-celebrity contestants on the regular Apprentice show mostly because with celebrities, “they want to protect their brand.” Such as in the case with Joan Rivers, winner of “The Celebrity Apprentice season two who was seventy-six years old at the time. “She had the stamina better than some of the athletes on the show”, said Trump. 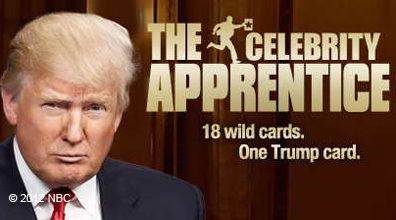 Trump thinks that candidates running for the Presidential office can learn by watching “The Celebrity Apprentice”. He said that when he was first considering doing the show, people told him not to waste his time because it’s a business-oriented show. “The Celebrity Apprentice” premiers on NBC Sunday February 19th at 9/8 c time.